The TORS.Travel Back Office enables Tour Operators to cost and book bespoke/tailor-made/dynamically packaged itineraries. The design builds on the creation and use of a variety of travel reservation systems over many years. This system is in production use today. Price an itinerary in real-time while talking to your customer or as the customer views your website. Create multiple revisions of an itinerary to track the different options offered to a client. Multiple prices (e.g. Parents and Child) within each revision. Automatically generate a written quote with resort/hotel/room descriptions and pictures, and check for outstanding customer contact. 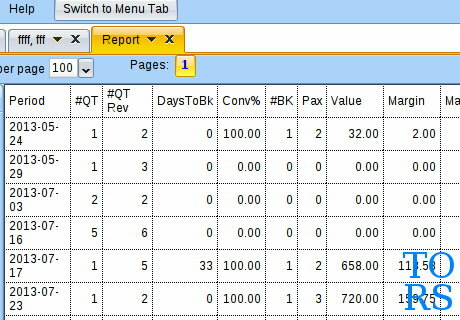 Once your customer accepts a quote, the TORS.Travel back office helps you generate requests to your suppliers, and to keep track of their responses. 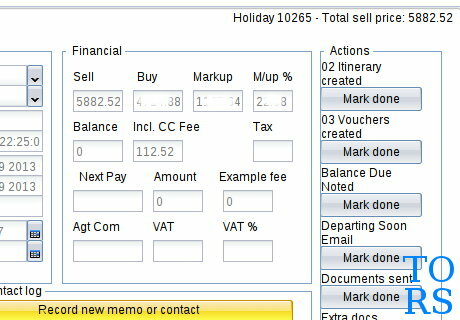 Of course, generating holiday invoices, vouchers and itineraries is simple & quick too. Changes to the itinerary can be re-priced and quoted at any stage, without affecting the existing booking until accepted. Click Start Tour to see a series of screenshots that run through creating a simple quote and converting to a booking. Start a new quote from the main dashboard; alternatively the user may create or find a client record and start a new quote already assigned to that client. 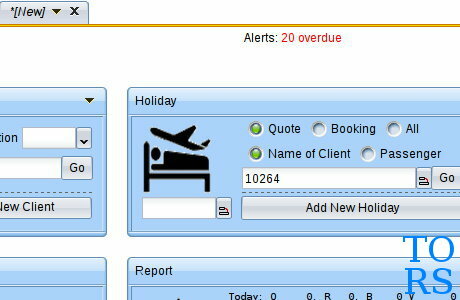 Created holidays can be found by id, partial lead or passenger name, and status. Set the preferred departure (start) date, typically after checking flight availability. Dates of hotels and tours included in the itinerary are automatically set, starting from the departure date; if the departure date is changed, all services are updated by the same change. 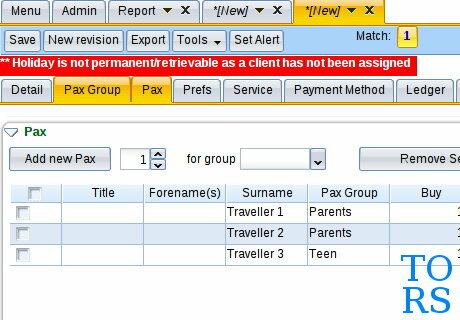 Two passengers were created by default for the new quote (customisable); the Add passenger button has been used to add the Teen passenger. A distinct price will be calculated for each group (Parents, Teen) and each group can have a distinct itinerary - in this case they will have different rooms. Flights can be dragged over from a supported airline website (as in this example); Alternatively contract flights loaded into the database can be added automatically by selecting "Auto Flights" or "Auto Open-Jaw Flights" which will determine the correct airport, and thus flights, to use for the itinerary. The same screen may be used for adding Train journeys or Ferry crossing. Add a hotel by typing its code (1-6 characters) or partial name, or selecting by name; the length of stay can be set at the same time. The hotel is added to the itinerary; with stay dates and pricing for the holiday and passenger groups calculated and updated automatically. 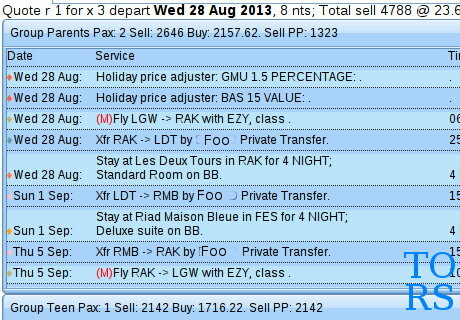 In this example I've added 4 nights at Les Deux Tours in Marrakech, and 4 nights in Fes (for this example hotel rates displayed are not from real contracts). 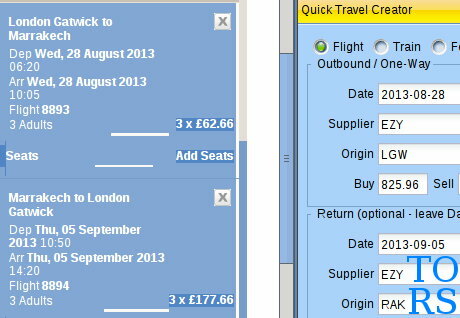 You can also see a £15 per person charge added by default (customisable). The hotels are added using the default room type assigned to each hotel; that's fine for the parents, but we want a single room (or possibly a third bed) for the teen. The single room has been chosen at Les Deux Tours (Teen price was re-calculated automatically), and we are now selecting the Single room at the Fes hotel. The automatic Transfer option "Airport/Hotel and Hotel/Hotel" has been chosen, resulting in the system selecting suitable transfers to link the hotels and airports in this itinerary. Should the hotels or itineraries change, new transfers to suit the updated itinerary will be provided. If a car was also added to the itinerary, transfers would not be created whilst the car was available to the travellers. The itinerary created is at the lower end of the clients budget, so lets add another itinerary with a different hotel selection and upgraded rooms. 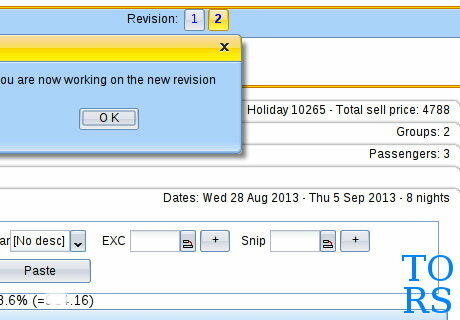 The "New Revision" button creates a copy of the existing itinerary which can now be modified separately; we can move between the various itineraries using the revision selector. The Tools button (out of screenshot) provides several options for comparing revisions. 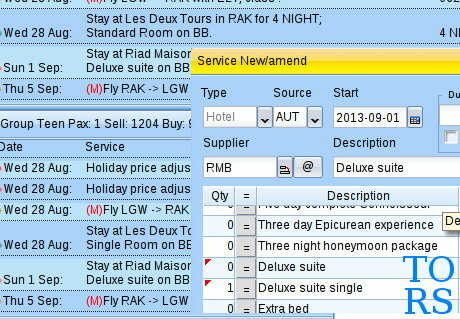 Replace a hotel simply by editing the existing hotel and selecting the new hotel; the upgraded room type can be selected at the same time. This is done separately in each group (this allows different groups to stay at different hotels). Transfers are updated automatically to match the new hotel. 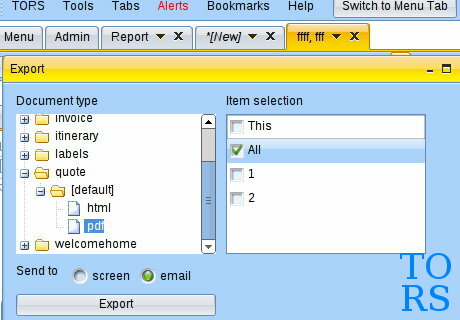 Export allows both quotes to be emailed in a single email, or displayed singly in the users web browser (for checking). The quotes can be sent directly to the customer, or to the user who can then write a personalised email before forwarding to the customer (the system can generate the email body also). The quotes can be included directly within the email or attached as a PDF. The quote design/layout is implemented as HTML according to your tour operator designs (different designs for different holidays or brands is supported). Let's assume that having had feedback from the customer and possibly making further holiday Revisions we now have an itinerary that the customer wishes to book. 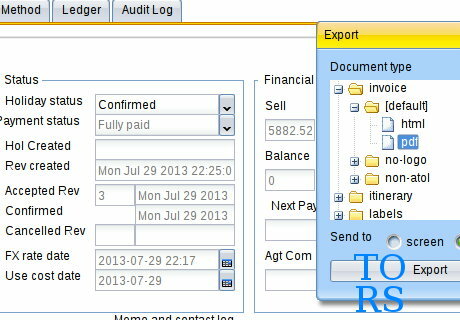 Creates Emails based on the services (hotels, transfers, etc) in the accepted revision (one email per supplier). These emails can be sent directly to the supplier, or via the user for checking. Generally details such as transfer times will have been set within the itinerary screen prior to requesting, so minimal changes are required on this step. The Status of each supplier (services) is automatically updated when the request is sent, along with a log of the request details. If the users makes the request via another method, the service status is updated manually in the Itinerary screen. Should, for instance, a hotel be unavailable, new revisions can be created just as when creating the original quotes, in order to propose an alternative itinerary. Once the user sees that all services that required availability requests have been confirmed, the user sets the Holiday status to Confirmed. The payment due from the client is automatically calculated using the Deposit date/amount preferences - flight cost can also be included. The clients payment method (e.g. Credit or Debit card) is added and a transaction fee can be applied based on that payment method. For non-refundable flights the user will now re-check the flight availability and price before proceeding. The user will confirm the payment to be taken, and obtain the clients payment details or accept a pre-authorised payment. The user takes the payment using your preferred Point of Sale system, and confirms that payment in the ledger screen; The user should then also complete any Low-Cost-carrier checkout. 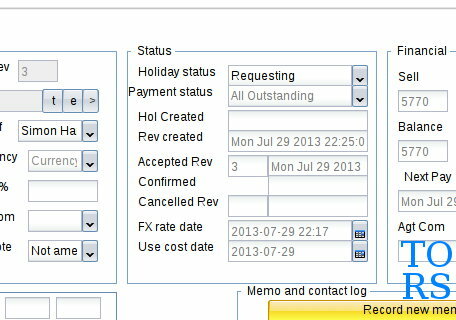 Invoice and Itinerary are created in the same way the Quote Documents were created earlier. 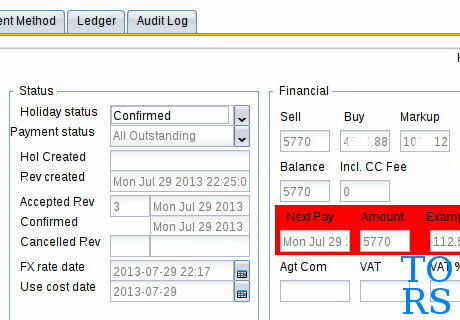 An ATOL certificate can be included automatically in the invoice where relevant. Vouchers are created in the same way the supplier requests were created earlier. 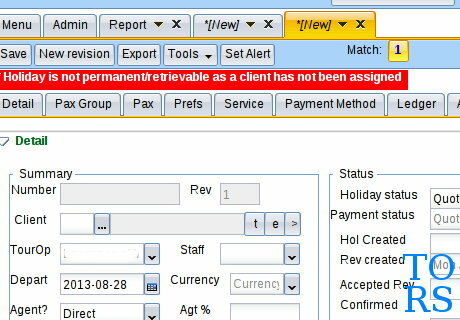 At any time the user may set an Alert date/message as a reminder to work on a quote/booking - this alert can optionally also be displayed to another staff member. 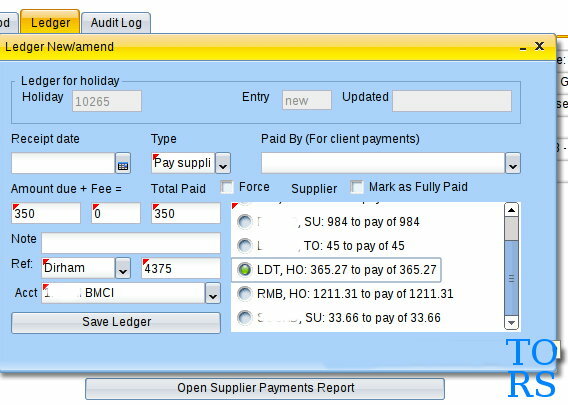 Expected supplier payments are calculated based on deposit date/percentage and final payment date rules. 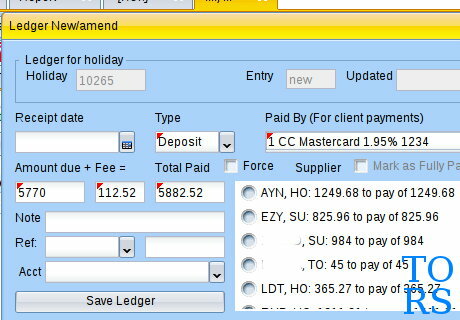 Invoiced amount is compared to quoted costs (plus configurable margin for exchange rate variation etc), so that user can query unexpected invoice amounts before paying/recording. Payments are record in the sales currency, in addition the currency/amount and bank account used for payment can be recorded. 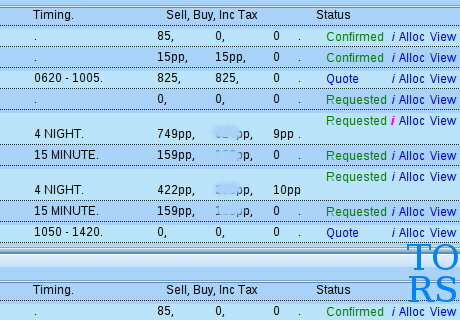 Reports include comparisons of quoted and final margins for each booking. 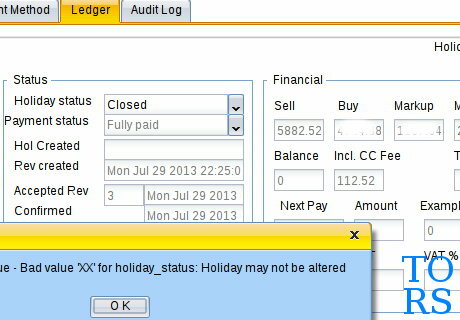 Once the client has travelled and all supplier payments recorded, the holiday status may be set to Closed. Once Closed no further changes are allowed to the holiday so that the financials are locked for Audits and it is clear in reports that total margins for this holiday are the final values.